Banská Štiavnica is an old-time mining town situated in the heart of the Štiavnické hills. The foundation pergamen of the town was not preserved, but town privileges were awarded in the first half of the 13th century following some indirect facts. The oldest relic giving evidence of the existence of town is a round waxed seal from a pergamen from the year 1275. This seal is the oldest town´s seal with a town´s coat-of-arms on the area of the former Hungary and simultaneously the oldest seal decorated by archaic mining tools in the world. Existence, prosperity and position of Banská Štiavnica are connected with mining and processing of precious metal´s ores. The golden age of town were the 18th and the first half of the 19th centuries when Banská Štiavnica became mining centre of Europe. In 1740 there was mined approximately 600kg of gold and 23 000kg of silver. In this time there lived many outstanding mining technicians – Matej Kornel Hell and his son Jozef Karol Hell, and a scientist, matematician, cartographer and builder Samuel Mikovíni. Thanks to this man in the surroundings of Banská Štiavnica was built a system of water reservoirs – „tajchy“, energy source for mining and adaptation technique of the second half of the 18th century belonging to the top of mining technique in the mining. An important economic and social position of Banská Štiavnica influenced ruler of the Austria-Hungary Maria Theresia to make decision about foundation of a mining academy in this town – for schooling of mining specialists and for metalurgists for all lands of the Habsburg´s monarchy. This mining academy was a centre for world-known scientists and specialists like Jozef Jacquin, Mikuláš Poda and other. This square is formed by a complex of citizen's houses built up in the 15th century and at the beginning of the 16th century. Mining tunnels lead into the most of these buildings. In the centre of this square stands a Baroque pestilential column with a sculpture of the Holy Trinity built in the years 1759-64 according to the proposal of Dionýz Stanetti. 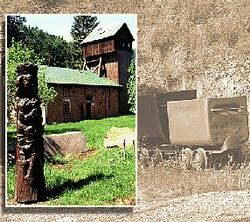 The sculpture was many times restored, the last at the beginning of the 1980s when the former statues were substituted by copies and originals were put in the exposition of the Slovak mining museum at the Old Castle. 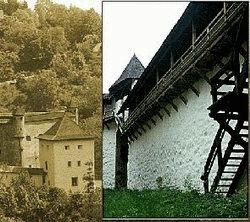 The Old Castle is a former Roman church built at the beginning of the 13th century and in the half of the 16th century integrated into a fortification system of town Banská Štiavnica and then rebuilt into a fortress against the Turks in the Rennaissance. The last important architectural modification was the rebuilding of castle´s tower into the Baroque. 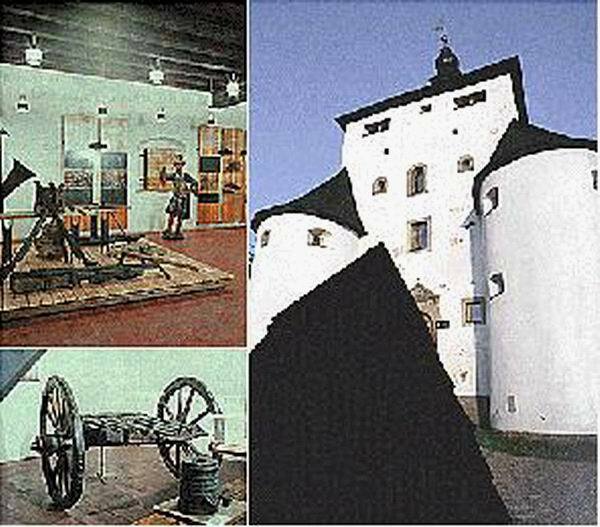 In the rooms of the Castle there is an exposition of the Slovak mining museum. It is formed by a complex of sacral buildings built in a beautiful natural environment of a stone hill – Scharfenberg which forms an unique architectural entity. It was built during the golden age of town in the years 1744-51 from donations of miners, traders and craftsmen. Their coat-of-arms are located in the chapels of the Calvary. Visit of the Calvary offers beautiful views of the environment of Banská Štiavnica. Dominant of this is Sitno hill emblazoned with legends. 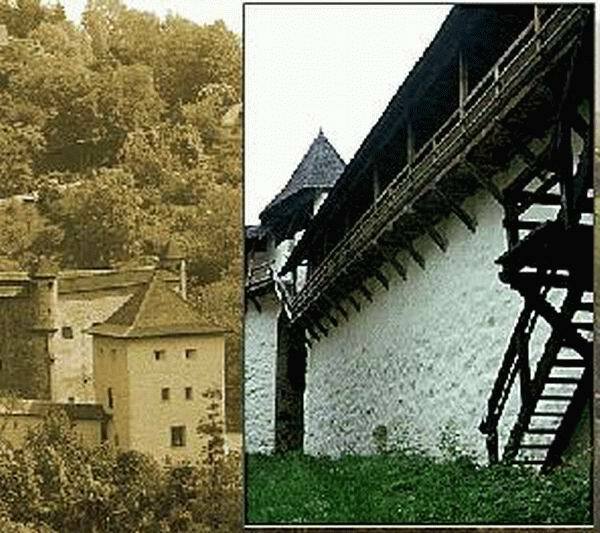 It is the name of a massive guard and signal tower located in the western part above the town´s settlement and was built in the years 1564-71 in the Rennaissance. The tower was a part of a fortification system of town during the Turks attacks. After the Turks withdrawal the tower had served as a stock of the black powder for mining and as a fire-fighting device. Nowadays there is an exposition of the Slovak mining museum about the fight against the Turks in Slovakia. From the surroundings of this object are beautiful views of town and of the environment of Banská Štiavnica.